My biggest issue with the previous UL Cook Kit was that it was not as stable as I liked. The legs on the titanium Esbit wing stove were spaced out to the point that my Heine pot would rest in between them, but just so. So, it worked, but I felt that it could be better. So, I decided to go back to my DIY hardware cloth pot stands. I could make these so that they fit inside the indention under the Heine pot, and resulted in a more stable/secure set-up. 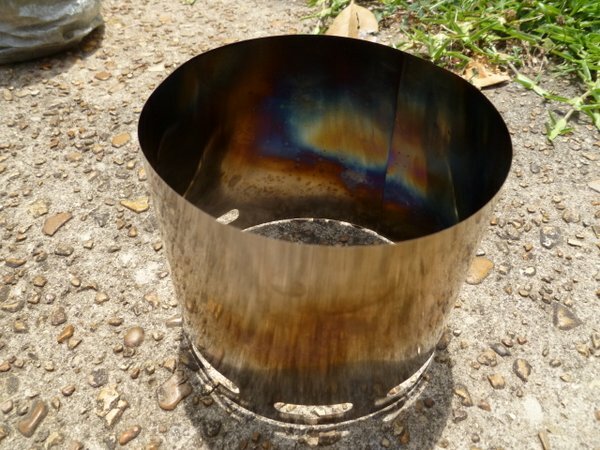 However, I really liked the stove part of the Esbit wing stove, particularly the results that I got when using it. But, I had to come up with something that would work with my DIY hardware cloth pot stand. So, after a bit of trial and error, I finally settled on a simple tray that mimicked the tray on the Esbit wing stove made from some titanium foil I recently got from Ti Goat. Simply put, the Suluk 46 windscreen only has air holes in one side of the windscreen (I could easily change this with a simple hole punch, but I’m sure that Steve makes them this way for a reason so I wanted to try to figure it out instead). Up to this point I have been using windscreens with air holes all the way around. So, what’s the difference? The side without holes can be turned into the wind and help block wind. This is definitely a plus when using alcohol or Esbit as a fuel source since these fuels are so susceptible to wind. Fewer holes = less air intake. This really puts the pressure on making sure that the distance between the fuel and the bottom of the pot is where it needs to be. Too close and the flame is smothered; too far away and the flame/heat is wasted. Because of the above mentioned points, it took me a few different tries using different stoves/methods of burning the Esbit with this windscreen and still getting results I liked. Long story short, this is where I finally came to making the above mentioned DIY titanium tray stove that mimicked the Esbit wing stove. (It is amazing at how just the tiny, 3/16″ tall walls around the edges of the Esbit tablet will make such a difference, but it did.) However, this small stove seems to be the most efficient when used with the rest of the system, so it is a keeper! I also decided to take advantage of the many Tyvek envelopes I have laying all around the house. Since everything is stored inside my cook pot (remember: packable/compact), I wanted a way to keep the inside clean as well as protected from the contents. To do this, I made a simple sleeve to keep the stove in which keeps the residual from the Esbit tablet inside the stove from getting on the inside of my cook pot. I also made a simple sleeve for the DIY hardware cloth pot stand which helps keep the sharp edges from damaging the inside of the beer can pot. All that I discussed above will do fine for boiling my water, and quite honestly, even serving as a vessel to eat from (which I will do on this trip). But there is actually more to a cook kit. Included in my cook kit, in addition to the above items, I also have an 8 oz Ziploc bowl/cup, a disposable spoon, 1/2 of a Lightload towel (which serves as a towel, pot grabber & holder) and a mini Bic lighter (I would rather a lighter to use with Esbit than a match). At first I was a little skeptical about the Ziploc bowl/cup in terms of only being 8 oz in volume. However, I have used it a number of times here at home to see if it would be ok to use in the manner in which I plan to use it in (which is really on drinking hot drinks) and I have deemed it worthy! Don’t get me wrong, it would be nice to have a little bit bigger cup, but this one seems to work well in a few different ways. It fits perfectly over the top of my Heine pot and provides more overall protection & durability to the entire system. The last individual item I want to briefly discuss is my LightLoad towel. These towels are not very durable in my experience, but considering the “light load” that I require of it when using with this cook kit, it works beautifully! First off, I use the towel to wrap around the pot stand (which is also wrapped in the Tyvek sleeve) when transporting the system. This keeps the pot stand from bouncing around inside the cook pot, as well as helping to protect the inside of the cook pot from the pot stand. As well, I use a folded corner of the towel as a pot grabber when pulling the pot off the pot stand when the water comes to a boil. I can also double the towel over and wrap it around the cook pot to form a pot holder which insulates my hand from the hot cook pot. And last, I use the towel to wipe the pot dry after using. Left: The entire kit all packed up; Right: Everything easily fits inside the cook pot, even fuel! This is a total of 1.75 oz, which gives me a net weight savings of 0.45 oz from the original set of core components! (Ok, so it’s not even half an oz…but the point is, it is less weight.) As well, some of it is still DIY, which makes it even more awesome! This is a total of 1.15 oz in “extras” and while they are all not needed (particularly the cup), I feel like they are quite necessary to complete the entire cook kit as a whole. So, when I add the total weight from the core components to the weight of the extras, I come up with a total cook kit weight of 2.9 oz! Overall, I am very happy with this system. I am not saying that it still cannot be improved upon, or that I will keep this system forever, but at the moment I am happy with it. I feel like this kit meets all of my requirements, and does so well. As I already mentioned, it is definitely more stable than previously, and as is proven by numbers, it is lighter. As well, considering everything fits inside the cook pot, or flush against the outside, it is very packable & compact. As far as efficiency, I feel like it is performing the same as it did when using the commercially manufactured Esbit Wing Stove. Saying this, I feel like I can consider this system to be efficient. However, as I noted when talking about the windscreen design above, I will continue to tinker around with it and see if I can witness different results. However, this system can vary so much just due to the surrounding conditions, I feel like it will be hard to come up with cold hard facts. All I can say at this point is that it works as well as I want and expect it too. YMMV/HYOH: What makes this cook kit “SUL”? Well, I don’t know… What I can say is that I called my previous post a “UL” Cook Kit simply because at that time, my base pack weight (BPW) when using that system fell in the “UL” range. Now though, I am using this revised cook kit with a “SUL” base pack weight. So, between this and the need for me to give this post a name, I called it a “SUL” cook kit, and for no other reason. I completely understand that everyone’s idea of “SUL” when it comes to cook kit’s will vary, but at the moment, this is mine. 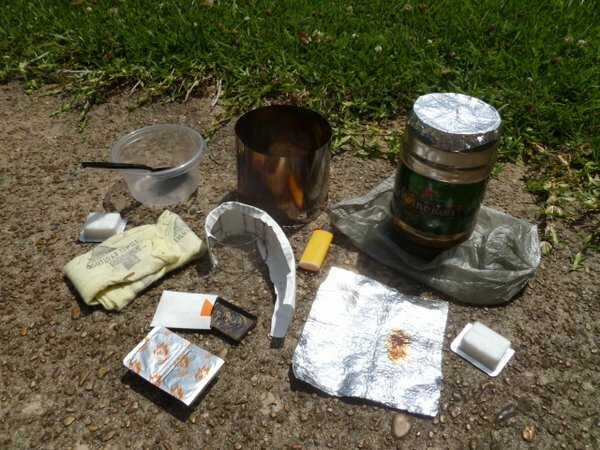 As far as I am concerned though, there is no set rules on what is and what isn’t a “SUL” cook kit, just as long as it works for you and still allows your base pack weight to fall under 5 lbs. 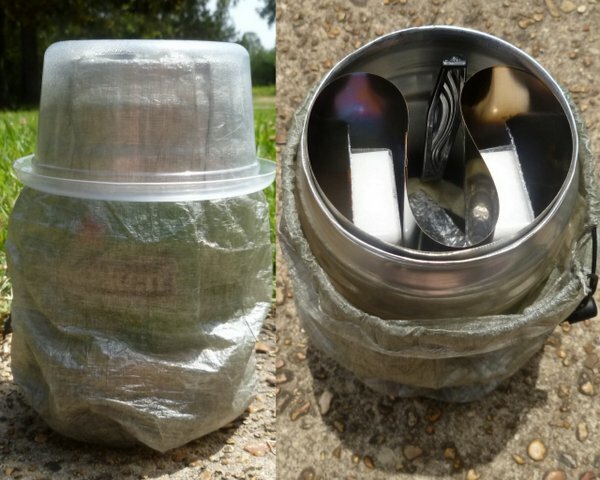 This entry was posted in Cook Kits, Cups/Mugs, DIY/MYOG, Dry Bags/Stuff Sacks/ Pack Liners, Gear, Gear Reviews, Gear Stores, Pack Towels, Spoons, Stoves and tagged alcohol stoves, Backpacking, Base Pack Weight, Beer Can Cook Pot, Bowl, Cook Kits, cook pot, Cooking System, Cuben Fiber, Cup, Cups, DIY, Esbit Stoves, Esbit Tablets, Hardware Cloth Pot Stand, Heine Cook Pot, Hiking, Hot Cocoa, Lightload Towels, Mini Bic, MYOG, REI, REI Long Handle Ti Ware Spoon, Spoons, stuff sacks, SUL, Suluk 46, Super-UltraLight, Ti Goat, Ti WIng Stoves, titanium, Titanium Foil, Titanium Stoves, Titanium Windscreens, Tyvek, UL, Ultralight, Windscreens, Ziploc, ZPacks. Bookmark the permalink. hey Stick…how about this? 2 cups of water to boil 2 seperate times from 1 single esbit tab…split the tab in half and with that new setup you made you can possibly snap some tiny tiny tiny twigs in the little “cage” with the 1/2 esbit tab?? ….. Awesome. Can you post your SUL gearlist? I switched to a Esbit/keg cook system similar to yours (the UL cook system) a couple of years ago. My wind screen was made from flashing ala caldera cone design, that gripped the Heineken can just below the upper raised collar. So it functioned as the pot stand also. I did have a couple of occasions when the fuel tab blew out while cooking so made a new windscreen with lower air vents along one 60 degree section rather than a full 360 degrees. Like you, I really like the 1 tab/day convenience and weight reduction over alcohol. Great read, thanks. Wow, so the wind blew the tablet out even inside the windscreen? I think titanium is a much better material for a windscreen than aluminum. Since the failure reports, I am nervous about using my JetBoil Sol Ti, so I have gone back to my Caldera Cone Sidewinder, which has a titanium windscreen. I kept the windscreen rolled up inside a .9L pot for about 9 months while I was using the JetBoil and I was a little apprehensive about unrolling it for the first time. I thought would have a memory effect and not unroll to a circle as was my experience with aluminum windscreens. To my surprise the titanium Sidewinder windscreen popped out to a perfect circle even after being stored rolled up for 9 months. There is very little memory effect with titanium windscreens, at least the one I have, which is nice on the trail, as it eliminates fiddling around trying to form the windscreen into a circle. Anyway, good luck on your backpack, and keep up the good work with your blog. Were there any other contenders for the Suluk ti windscreen? I can’t think of anyone else that makes them short of buying some ti-goat foil and trying it out myself. Do you feel that the holes on one side as opposed to all the way around hurt your overall efficiency? Does it pull the heat away from the center of your pot? Are you talking about the one that Brian has that resembles the Gram Cracker stove? I would say that the bottom of a Red Bull can should work ok…only one way to find out though… I will say though that I found about 1.5″ between the bottom of the cook pot and the fuel seems to be the best distance between the two that I have found. Any closer and it smothers the flame a little too much, and more and it is losing the heat. Very cool! Temps was a factor in my hike. A cold front came in and stayed for 4 days which caused me to go through more fuel than expected(temps dropped to low 50s to mid 40s at night in June). Luckily my zero day in town allowed me to get some heet to replenish. Looking forward on your trip report. For our hike, I’m expecting night temps low 50’s to high 40’s. I will be carrying 3 (maybe 4) Esbits on this trip, and so far all of my testing shows that I can easily get 2.5 cups of water to boil on one, with a little additional boil time. As long as I can get this at night, I am good since I am doing as you did and going with cold breakfast each morning. Anyway… looking forward to your TR man! Videos will start tomorrow. I have the rest of the week off. On the train back home. Got my trail legs day 4 and increased my mileage. Today I broke 21 miles and was able to make it home 2 days earlier. Some equipment shined while others showed failure. Full gear report in a couple of weeks. Hope you have a blast on your trip! Very nice kit that you’ve put together. Do you have any issues with the odor of the Esbit tabs getting into the pot? May not be an issue since they are all sealed and you’re using a full tab at a time. Also like the 1/2 towel you’re using. It definitely helps to grab the hot pot and it’s also good for storing everything because you can use the towel to help keep items from rattling around. There is definitely a smell associated with Esbit. However, I do not plan on storing them in a plastic bag in my cook kit. It has not been a problem for me so far, especially when still packaged. The cuben fiber stuff sack does a pretty good job at containing the smell, so the rest of my pack/gear does not have that distinct smell! As far as the towel is concerned, I was not a huge fan of them when I first tried them, simply because I find them to be inadequate for heavy use items (such as bathing or wiping a tent down). However, I have ended up liking them a lot to use as I am with my kitchen set-up. 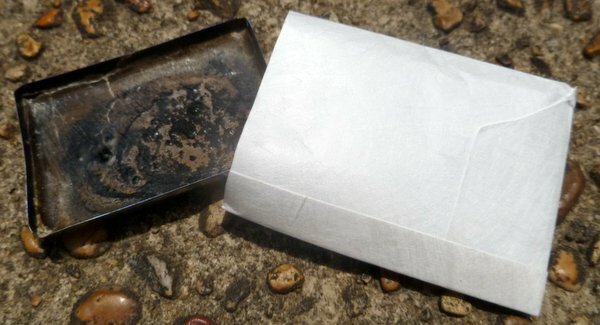 As well, I carry the other half in a pocket and use it as a general wiping my face towel during the hike. After wetting them down the first time, they get quite soft so it is gentle on the skin. And as inexpensive as they are, I can throw one away after a few trips with one and not feel bad. I like how you show your criteria for a cooking system that works for you. In your video, in particular, you want 2.5 cups of water. Everything else is mentioned in the Blog. Most people take what is available in the store that doesn’t really work well for them. The fact you show your thinking it through is particularly helpful. People need to do that. My UL and SUL are different: I put emphasis on different aspects of the cooking system. At least, I am looking for what works for me. Thanks Connie. I agree, I think that a lot of people (such as newer backpackers, myself included) just went with what was commercially available, which is basically a “one-size-fits-all” kind of thing. Of course though, we all know, one size does not fit all, but until we each figure out what it is we want, then I think it does a fine job. Hey Stick, nice to see you have implemented a lot of what you and I have been discussing over the last few months into your new cook kit. I am sure it will work out very well for you. I will go ahead and release the article I put together on mine a few months back (before we started yapping about this setup), which as you know is pretty much identical to the one you have got now. Only difference is that I am using a slightly smaller stand, and a slightly different pot, and of course a different spoon. I like the little Ti esbit stove holder you finally put together. Looks like it is keeping the esbit run off contained very well. Nice job! As you know, I had some extra pieces of ti foil lying around, and it hit me to just try and mimic the tray that was on the Esbit wing stove. I figured since I was getting longer boil times and faster burn out times, it had to be getting too much air…somehow. So, rather than alter the windscreen, I decided to try this first, and it worked pretty well. As for the spoon, I actually planned to use an REI Campware spoon. It is a nice spoon IMO, but at 0.4 oz, it is a bit heavier. Also, since I am going to be eating from the Heine can on this trip (Ramen Noodles though, so nothing real messy) the REI spoon was a bit big for this. The disposable spoon is considerably lighter weight and the size is more appropriate. Of course it is not as durable as the REI spoon, but it will fit inside the cook pot, so I feel like it is well protected. And yea, so far the stove does a good job at containing the Esbit run-off. I just wonder how it does in the long run with build up. I will have to scrape it out with my knife on occasion…although, I also feel like it will only go so far as the flames will keep it in check up to a point… just a theory so far though.. Anyway, thanks for stopping by and commenting! Appreciate it. I have never actually tried to compare boil speed times with and without using the Suluk46 Ti Windscreen. I suppose my one specific question on this would be, not so much boil times but rather whether or not you can get two uses out of a single esbit tablet. That to me is the holy grail so-to-speak of finding a perfect esbit cooking setup. That is, being able to use a single esbit tablet per day (once in the morning and the rest at night). I had one setup at one point that I was able to do that, but I stupidly forgot what it was (way back when I started hiking) and no matter what I can just not get one esbit table to boil 2 cups of water with a half an esbit tablet. I usually end up with about 10% of it remaining, which is sort of worthless to reuse at that point, so I just end up using the remaining tablet to boil up a bit more water to top off any tea or coffee after I have drank some. Yes, I am using the Zelph 2 Cup Flat Bottom pot ( http://www.woodgaz-stove.com/foster-2-cup-flat-bottom.php ) which is 29.76 grams without the lid. I have bought two of them so far and they have proven to be pretty durable. I keep the second one just encase he decides to stop making them. I will probably by two or three more of them as I get the spare money. I really like them and it has proven to be just about the perfect size. I have sort of given up on the 300 and 400ml Ti pots. As you well documented in your blog about the MLD one, they are just too heavy for the amount of water that they hold. The fact that I can have a pot that holds twice as much at half the weight, and still have a pot that is durable enough for thousands of miles (granted you and I take exceptional care of our gear) is just good enough for me to stop using those Ti cups/pots. You should really check out the “Sea To Summit AlphaLight Spoon”. It is the lightest thing out that you can buy and its freaking dirt cheap compared to the other ones. It is all I have used for years. Until I had my custom spoon made (pretty sure I sent you photos of it) it was the lightest thing I could find that had any durability to it. My custom spoon is 5.5 grams but that StS AL spoon is 7.5 grams and that is amazingly impressive. I just got back from a 5 day trip and should have some (very crappy) video up on it tonight or tomorrow. There will be a sort blurp in there where I showed my gear kit. Anyway, look forward to hearing how your hike goes!! Yes, I agree, that would be nice to get 2 boils with 2 cups of water from 1 tablet. I know that with my wing stove, I was able to boil 2 cups, pour off one for coffee or what not and add back in 1 more cup of cold water and bring those 2 cups to a boil again just before the tablet would flicker out. I have not tried to do this exact thing with this set-up, but instead, I just fill the Heine pot with 2.5 cups of water right off the bat as this is all that I really need. Also, this way I can get the stove going and then go on about setting up camp/bed for the night. By the time I am done, the water will have come to a boil and the Esbit should be out or almost out. Also, for this trip, I am only carrying 1 Esbit per day since I will only be cooking at night. The rest of the day will be cold food or bars. This way, the 1 Esbit will be plenty for what I need for a single day. As far as cleaning off the Esbit, I am not too worried if I don’t get it all off since I can keep it contained in its own stuff sack. I have found that most of it will come off just by wiping it through a grassy area. Then a little sand will take card of the tacky feeling. Then at home I can just run it under the faucet and rub most of it off with a towel. But I will keep the DR B tip in mind too! Thanks. Anyway, I look forward to your videos and your write up on your cook kit!